Located in Guilin National High & New Tech Industry Development Zone, Guilin Huiang Biochemistry Pharmaceutical Co Ltd was founded in August 1998 and has been specially engaged in extracting and developing taxanes products,with Paclitaxel drug substance (API) and docetaxel drug substance (API) as its leading products. Huiang is the largest paclitaxel drug substance manufacturer in China, with an annual output of 400kg. The natural paclitaxel API and semi-synthesis paclitaxel produced by Huiang have all obtained national drug registration licenses and GMP certificates, which¨s processes have respectively reached national leading level and international advanced level. It¨s another new product Docetaxel API has also obtained the license and certificate, with a production scale of 100kg per year. As a certified high-tech enterprise, Huiang possesses its own intellectual property rights and advanced processes, to ensure its products strictly to the highest national quality standards. Due to its products' high quality, Huiang has become a supplier of statutory reference standards and impurity reference standards for national statutory administration. 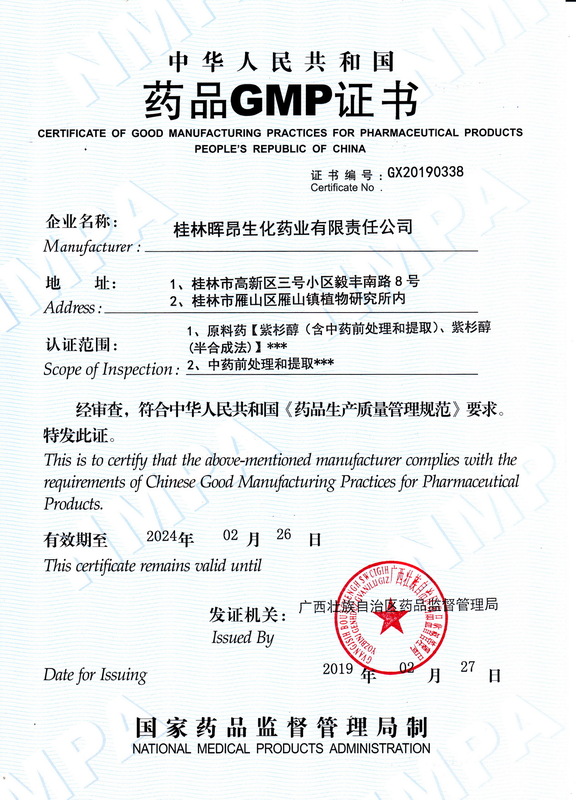 Huiang was also entrusted by national pharmacopeia committee to be one of the members studying the new concerned standards in Chinese Pharmacopeia. Huiang focuses on R&D and self-directed innovation, and has obtained 4 domestic patents including one utility model patent and three invention patent. Now a new apply for domestic invention patent has entered into inspection. Besides, one international patent has been being applied for which was authorized in September 2008 in Swiss and has entered into inspection in USA and Europe. Huiang has 103 employees, among which 32.8% are professional technical personnel allocated in deferent departments to adapt the products¨ manufacturing. Huiang developed a new semi-synthesis project with 7-xylosyl-10-de-paclitaxel as raw material, making a breakthrough in this field. This project gained the Innovation Fund For Technology Based Firms and has been inspected and accepted. To ensure the supply of raw materials, Huiang built its own plantation in Zhiyuan county, Guilin City, and established a branch company with 74 employees including 36 technicians. The plantation has 3.5 million media yew planted and is mananged under GAP. Huiang¨s products occupy over 70% market shares in Chinese market, purchased by some traditional large paclitaxel injection factories and lately by some newly factories. Huiang explores international market actively and has obtained DMF number of FDA, while the applying for EDMF and COS are ongoing. Trough years of effort, Huiang has grown to be a modern pharmaceutical enterprise and earned more important position in the domestic industry. Now it is the key enterprise of Guangxi in pharmaceutical field, key enterprise of Guilin in industrial development, and the Natural Anti-cancer Pharmaceutical Research Center of the City, honored with the Award of Self-directed Innovation and the Award of the Technical Improvement by Guilin High & New Industry Development Zone, and the First Prize of Science and Technology of the City for its paclitxel API project. 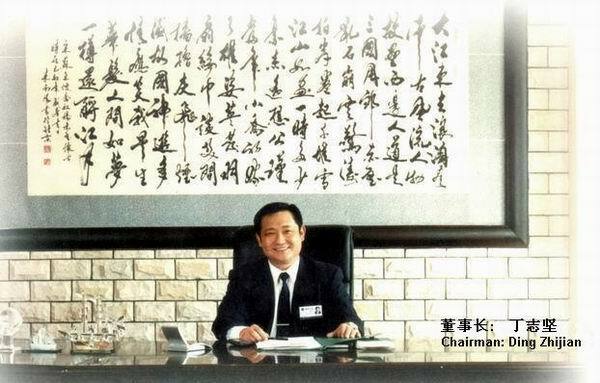 ＾To make good affordable drugs to the people around the world forever.￣ With its own entrepreneurial idea and the philosophy of quality business, Huiang will continue to work towards its objectives and certainly expand further in future.